Having trouble finding the sweet spot? Where you’re not jumping the gun or hanging on for dear life. Then my upcoming Writer’s Store Webinar is for you! We’ve all heard the Hollywood adage that you only get one shot at having your script read. Is this true? Unfortunately, yes. Unlike your friend who’ll read multiple drafts in exchange for tequila most executives aren’t so easily plied. They have an ever growing stack of material to read and an inverse amount of time to get to it. If a piece doesn’t grab them immediately they’re not even going to finish it, let alone read another draft. You might decry this reality but if you were in their shoes you’d do the same thing. It’s best to embrace the truth and write the best piece you can. But how do you know you’ve written the best piece you can? How do you know when your screenplay is ready to go out into the world? This, of course, is the million dollar question. Some writers send their material out before it’s really finished; while on the other end of the spectrum, some writers never feel ready and get caught in an endless loop of rewriting. Neither scenario works. You don’t want to jump the gun or hold on for dear life. The trick is to find the sweet spot for when you’re piece is truly ready. Knowing when your script is ready requires having a good sense of your overall intentions and the story you want to tell so you can assess when you’ve reached your goals. You need to be able to dig deep and see through any excuses you might be making to avoid doing the real work inherent in rewriting. You also need to honestly assess any fears around going out to the world so you don’t get caught rewriting endlessly. Once you’ve done this, you need a solid plan for how to take your script out. This includes managing your expectations and getting a clear idea of where your script fits into the marketplace. This live webinar will discuss these points (and more!) and will give you valuable tools you can use to assess when you’ve reached the “sweet spot.” Learning how to make this important judgment call will ensure you go out at the right time giving you the best possible chance at success! Here’s the link to register. Hope to see you there! Just found out that a film I consulted on, My Awkward Sexual Adventure, is getting its world premiere at the prestigious Toronto International Film Festival! I couldn’t be happier for screenwriter Jonas Chernik and director Sean Garrity! Check it out if you’re going to be in Toronto on September 11th. And another guest blog post this time on Jamie Lee Scott’s website Strange Musings from an Author, Screenwriter and Artist. I first met Jamie in Twitterverse (if you’re not already following her you should!). Her funny, entertaining and informative tweets got me hooked. I then had the good fortune of meeting her this June at The Great American Pitchfest where I was teaching a class. It was wonderful to finally have a face to put to the tweets. While our meeting was all too brief I could see that Jamie’s on-line personality was a true reflection of the live version. She’s witty, smart and an all round good peep. I’m honored to have an opportunity to contribute to her blog. Recently Jamie posted a challenge to writers to choose their favorite screenwriting book and follow it to the letter, exercise by exercise, from first page to last. I couldn’t yell, “Don’t do it! !” loud enough. I’m a script consultant and story editor and I have a shelf full of “go to” books on screenwriting but I would never recommend someone undertake this task. “Why?” you ask. “Doesn’t Robert McKee sing the gospel? Isn’t following Blake Snyder the fastest way to write a Hollywood blockbuster?” In short, NO. Don’t get me wrong I have enormous respect for many of the screenwriting gurus out there (Field, McKee, Seger, Synder, Vogler, Aronson, Bonnet, Truby among them) and what they say will give you the building blocks you need to write a screenplay. There are absolutely required reading. But they differ widely in their theories and approaches, many of books flat out contradict each other and everyone claims to have “the secret” to writing a screenplay that is not only amazing but will sell! At the end of the day they might be chock full of useful information that will help you write your script but none of them have all the answers. There simply isn’t a magic bullet. Success in screenwriting is based on many intangibles including productivity, talent and connections. You have to write (and rewrite a lot), you have to be good at it and you have to get your material to the right person at the right time. These are things that can’t be found by following a book to the letter. – Give you the building blocks you need to craft a screenplay – most importantly the three act structure. – Offer valuable tools and tips for developing characters, conflict, dialogue and theme (among others). – Introduce you to the format, language and jargon of screenwriting. – Guide you in the way to properly develop a script from log line and outline through to rewriting. – Give you ideas to improve your productivity and get to know your individual process of writing. -Introduce you to the varied approaches to screenplay development from Christopher Vogler’s take on The Hero’s Journey to Blake Snyder’s beat sheet for writing a high concept commercial blockbuster. – Explain the business of screenwriting from getting an agent to how deals are structured. There’s a lot to be gained from immersing yourself in screenplay theory. Reading the “experts” is an absolute must for any new screenwriter. As you read you’ll also get a sense of what approach makes sense to you on an intuitive level. As you write you’ll see what ideas float back into your consciousness and what tools seem to be useful along the way. But don’t worry too much if things don’t add up exactly as you’ve been instructed. Trust your instincts and keep writing. If you’re stuck go back and reread that chapter that resonated for you. Find guidance and inspiration but don’t get too focused on any one idea or believe that any one of these theories have the secret solution. Ultimately you have to trust yourself more than any particular theory or book. This is why I wouldn’t recommend following any one book from first page to last because at the end of the day the only sure fire way to write a script that will sell is to sit down and write it! Check out my guest blog post on Julie Gray’s fab site Just Effing Entertain Me! Guest Blog by Ruth Atkinson! I can’t tell you how many times new writers have said this to me. And I emphasize NEW writers. Any experienced writer will tell you it takes years to learn the craft of screenwriting to the point where you are able to write a marketable script that will sell in Hollywood. As a new writer not only are the odds stacked against you but the bar is set much higher than for a produced writer. Why? Because you’re untested, have no track record and are competing against 1000 other screenplays that are out there vying for an execs attention. So why would you dare go out there with anything other than your absolute best? As a new writer your piece not only has to have an incredibly fresh, exciting, original concept it has to be executed flawlessly meaning it has to follow conventional structure (without being formulaic), have distinct characters and a well paced plot that escalates to a meaningful climax and resolution. It also has to be “about” something and have a reason to be told. On top of this if you are a new writer you need to have an original voice (worked for Diablo Cody) in order to get noticed. I don’t know how you can hit this mark in just a few short months. To forgo rewrites because it will be rewritten anyway is a good way to make sure you will remain unproduced. You only get a handful of chances to get your work read by someone who can move it forward. You want to make sure your screenplay is damn good and ready when it lands on their desk. You may write quickly but a truly well written, marketable screenplay that will stand out from the pack takes time. Get good at your craft, and then get your script out there. Not a moment sooner. Whew. I feel calmer already. Thanks for listening. Three weeks ago I taught a class on Theme at the Great American Pitchfest. Three weeks ago? Why am I just posting about it now? The short answer is I’ve been busy with follow up! I met so many cool peeps – writers, fellow consultants, producers and directors and I’ve been connecting with them all post-fest. And I’m not alone in this. Judging by the twitter conversations I follow many of us who attended have been touching base and checking in. Several people who attended my class or who I met briefly in the halls of the Burbank Marriott have reached out as well. I also had a handful of clients attend and across the board the one thing they all commented on as being the most important aspect of the event was the other writers they met while waiting to pitch, grabbing coffee or attending a class. Of course attendees would love to interest an executive in their work but for many the networking was invaluable. So often writers work in isolation so an event like this creates a wonderful opportunity to connect. Even for me! The Great American Pitchfest is held annually (they’re in their 9th year) and offers writers an opportunity to pitch their screenplays to executives. The day before the pitch event is an impressive roster of free, yes free!, classes on all aspects of screenwriting for TV and film. Consider attending next year! Ok, I think pretty much everyone would agree that pitching is about as fun as sticking needles in your eyes! Alright there might be a handful of people who love it or have come to terms with it as a necessary evil but those who are new to pitching generally feel something akin to fear and loathing. Why? It’s hard! It’s very challenging to condense your 110 page script into a 1-2 minute pitch that is conversational, entertaining and contains just enough information to hook an executive. But pitching is a fact of life for working screenwriters so it behooves you to get comfortable with an admittedly uncomfortable process that is only one step removed from speed dating. And we all know how fun that is! One way to get more comfortable is to practice. Obviously you should do this with your own script (over and over and over) but you can also practice using produced movies. For example how would you pitch The Descendants? • My script The Descendants is a drama set in Hawaii about Matt who’s emotionally awol and calls himself a backup parent to his two daughters. His life’s thrown into turmoil when his semi-estranged wife, Elizabeth, falls into a coma after a boating accident. The doctors tell him she’s not going to recover and he has to take her off life support. Matt tells his eldest daughter Alexandra this upsetting news and she reveals his wife was having an affair and planning on leaving him. • Matt had no idea she was cheating on him. Sure they had their problems but this was not what he expected to hear. Once he recovers from the shock Matt decides he has to find her lover, Brian, and tell him she’s dying so that he can say goodbye. Brian is vacationing on Kauai with his family so Matt takes his girls, and Alexandra’s slacker friend Sid, and tracks him down. It takes some time for him to orchestrate a moment alone with Brian but he finally does. Turns out Brian wasn’t even in love with his wife and is in fact devoted to his family. This knocks the wind out of Matt’s sails, but job done, they return home. From here you want to quickly wrap it up and get to how the story is resolved and what your protagonist learns. • Back at the hospital they take Elizabeth off life support and everyone gathers to say goodbye. They’re interrupted by Brian’s wife, Julie, who drops by the hospital with flowers and tells Matt she forgives Elizabeth even though she destroyed their family. This helps Matt to forgive his wife as well and he says goodbye with a tender speech and a gentle kiss. Our story ends with Matt and his girls cuddled on the couch with a big bowl of popcorn and a movie and we see that they’ve been brought together by this tragedy. • Matt’s an emotional absent husband and father whose life is thrown into turmoil when his semi-estranged wife falls into a coma after a boating accident. Matt learns she will never wake up and her doctor tells him she needs to be taken off life support. He tells his eldest daughter, Alexandra, of her terminal prognosis and she reveals her mother was having an affair and planning on leaving him. Once Matt recovers from the shock he decides to find Elizabeth’s lover and give him a chance to say goodbye before he pulls the plug. • While this is going on Matt, who’s a lawyer, and the sole trustee of his family’s extensive land holdings, is trying to help his family find a buyer for their land which they are being forced to sell. As they settle on a buyer Matt learns that Brian, who’s a realtor, is the brother in-law of the man they are considering for the sale. If all goes forward Brian will stand to make a lot of money. Once you’ve set up the main crux of the subplot you’re back to the main story beats and would return to the B-story once the main story has been resolved. • Following Elizabeth’s funeral Matt’s extended family gathers to sign the papers for the sale of the land. Matt has a sudden change of heart and decides not to sell angering his relatives but bringing himself some much needed peace of mind. Coming back to the subplot in this way shows that Matt has been transformed by the story events. Keep in mind that your pitch should “spin” the story not tell it beat by beat. While you want your pitch to accurately reflect your script (for example if your piece is a musical you’d want to state that up front and if it’s really a drama don’t feel you have to play up the comedy if it isn’t there) you can compress, delete, rearrange as needed. The idea here is to entice the executive into wanting to hear more and if this kind of story is in your executive’s wheelhouse (to quote George Clooney) they’ll hopefully ask for your script. So keep things light, fast paced and conversational. In time pitching will get easier and you might even find you like it. Yes, really. And if you need some extra practice trying writing pitches for exisiting movies. It can help you to fine tune the skills you need to give a winning pitch. In my two previous posts I talked about theme and how you can use your protagonist’s arc to clarify what your story is about. You can also use this arc as the spine for pitching your story. Knowing how to pitch your script can be a challenge particularly deciding what’s essential information and what you can leave out. Everyone is different and it takes time to find your pitching “voice” but one way to approach it is by looking at the protagonist’s arc over the course of the story and using this as the spine of your pitch. 1. Title – Um, well, this obvious, right? 2. Genre – It’s ok to mix genres a little bit here but try to stay within generally accepted genres ie: comedy, comedy-drama, thriller, action-thriller. Not sure? Check out imdb.com to get an idea of the most common genres. 3. Hook – This is the one idea that makes your story unique. In The Artist this would be the fact that it’s a silent movie. If you don’t have one don’t worry – not all stories do. 4. Protagonist – One or two sentences that briefly summarize your main character. For example if you were pitching The Descendants you might say, “Matt is an emotionally awol, self described back-up parent.” Or if your story was Up you could describe Carl as a curmudgeonly recluse unable to connect with anyone since his wife died. 5. Goal – Clarify the protagonist’s main external goal. In The King’s Speech this is for Albert to overcome his stammer. Or for The Descendents it would be for Matt to find and confront his dying wife’s lover. 6. Problem/Obstacles – In many ways this is the crux of your pitch and also the most difficult. The challenge here is to know just how much detail to go into and how to succinctly describe the series of escalating problems your protagonist encounters. This is where it can be really helpful to know what your story is really about and how your protagonist grows over the course of the script. What you’re looking for here are the main turning points of the second act. The beats that move your character forward externally and internally. The first of these is the main problem which generally falls around the end of the first act. In The Descendants this is the fact that Elizabeth, who has to be taken off life support, was having an affair. With The Artist this is when George is proven wrong and talkies start to become popular. In Drive this is when Driver (Ryan Gosling) offers to help Standard (Oscar Isaac) and the robbery goes awry. From here your pitch should include how your protagonist handles this problem(s). Think 3-4 beats that form the central spine of your story be sure to include the end of the second act turning point and the climax. 7. Resolution – This is how the story ends. It shows how your protagonist solved their central problem and whether or not they achieved their goal. It also reveals what your protagonist has learned over the course of the script and is where the theme is mostly clearly articulated. In The Descendants this is Matt’s tender speech to Elizabeth which shows us he’s finally able to reconcile her transgression and tell us that The Descendants is ultimately a story about forgiveness. When giving your pitch you want to “spin” your story not tell it plot point by plot point. If this means you put the main events in a slightly different order, leave out a character or compress a subplot it’s all good. Succinct is always better so just stick to the key events that tell us what happens and what your story is about. The goal here is to link the main story beats together in such a way that it feels conversational and entertaining. Imagine you’re having a few drinks with your friends and telling them about this great movie you just saw. The pitch should entice the executive you’re pitching to to ask for more information and hopefully to see the script. Movies are about transformation. We want to see someone change. It’s the reason we are drawn to sit in a dark room and eat popcorn with a bunch of strangers. But this transformation has to have a larger meaning. This is where knowing what your story is about comes in. Without a clear theme your story doesn’t have the context it needs to truly affect the audience. But how do you establish the notoriously hard to pin down theme? In my last post I talked about how the theme of a story can be articulated by what the protagonist learns. This means that we come to understand what the story is really about by seeing the protagonist experience a meaningful epiphany. In order to ensure your main character has a specific moment of realization we need to give them an emotionally compelling transformation which is a two step process. First you need to give your protagonist a subconscious longing, need or desire that they are initially unaware of (reconcile loss, gain confidence, forgive). This becomes their internal goal. It’s why they want what they want. It tells us what is really motivating them to achieve their external goal and articulates what they really need (even though they don’t know it yet!). The second part of developing the protagonist’s transformation is giving the protagonist an epiphany that makes the subconscious conscious. This is where they realize the flaw they must heal in order to be transformed. It’s this moment that tells us what the story is really about. • The opening scene at Wembley Stadium establishes Albert’s stammer and his considerable fear of public speaking. His subsequent visit to the doctor tells us his external goal is to overcome his speech impediment. • Albert’s father, King George V (Michael Gambon), gives his annual Christmas broadcast and afterwards bullies Albert into trying the microphone reminding him he has to overcome his stammer sooner than later. This beat sets up Albert’s lack of confidence and roots his weak self esteem in his antagonistic relationship with his father. We know that Albert’s subconscious inner goal is to feel worthy of being King and to do this he’s going to have to let go of his unattainable need for his father’s love and approval – the flaw that stands in the way of his self confidence. • With his father’s words ringing in his ears Albert begins seeing Lionel Logue (Geoffrey Rush) to address his stammer. During their sessions Albert resists discussing his past but as the story progresses and their friendship solidifies he reveals some of the more difficult moments of his childhood. These conversations nicely set up Albert’s growing awareness of the real cause of his stammer and ultimately his lack of confidence. • King George V dies and Albert’s brother (Guy Pearce) inherits the throne becoming King Edward VIII. During a session with Logue Albert reveals his worry that Edward will abdicate and he’ll be forced to take over. Lionel assures him he has what it takes to be King which forces Albert to confront his lack of self worth head on. But Albert’s not yet willing to look at his insecurity and instead lashes out at Logue ridiculing his failed acting career. • Their altercation causes a rift in their friendship that isn’t repaired until King Edward VIII does in fact abdicate and Albert is made King. Now, unable to avoid a future filled with public speaking obligations, Albert seeks out Logue and apologizes. Their reconciliation underscores an internal shift in Albert’s character and his acceptance of his fate shows the first glimmer of his willingness to confront his flaw and believe in himself. • Albert and Logue prepare for Albert’s coronation at Westminster Abbey. While they do this the Archbishop of Canterbury (Derek Jacobi) investigates Logue’s credentials and in a climatic scene interrupts their preparations to tell Albert that Logue isn’t even a real doctor. The Archbishop’s shocking revelation proves Albert’s worst fear – he lacks judgment and has trusted someone he shouldn’t have. He is in fact not fit to be King. • Albert again lashes out at Logue. But instead of backing down Logue helps him to see that he doesn’t need the Archbishop, his father or anyone else’s approval, including Logue’s, to be worthy of the crown – he just needs his own. This is Albert’s epiphany. He is now conscious of how his lack of self worth, instilled in him by his father and reinforced by his debilitating stammer, has held him back from embracing his role as King. This new awareness gives him the confidence he needs to accept the position with dignity. This moment tells us what the story is really about and articulates the theme of accepting yourself flaws and all. • Albert’s newfound confidence and acceptance of his role as King is beautifully established in the final sequence when he confidently gives his wartime address. This sequence works as well as it does because we know how much Albert has grown over the course of the story. We have witnessed his transformation from being unable to speak to the crowd at Wembley to giving an inspiring radio broadcast that unites the people of Britain and earns their undying trust and respect. If The King’s Speech was just about how King George VI overcame his stammer it wouldn’t engage us the way that it has. It’s his internal journey as he gains self confidence that keeps us hooked and ultimately moves us. Giving your protagonist a compelling emotional transformation is one of the best ways to not only fully engage your audience but ensure you tell a meaningful story with a clearly articulated theme. When I work with writers or evaluate pieces for the Sundance Lab, FIND and Screen Queensland one of the questions I often ask myself is, “What does it all mean?” A lot of the time once I’ve finished a script I can’t answer this question and am left searching for the point of the story. This is not what you want to happen. A story without a clear theme causes a reader to pass and leaves the audience wondering why they wasted their time. Once again so not what you want to happen. But theme is notoriously difficult to nail down and often doesn’t reveal itself to the writer until they’ve written a draft or two. This is par for the course and it can take awhile to figure out what you want to say and why you’re writing this particular story. But at some point you need to make a decision about what your story is really about and make sure the theme is clear. One way to tackle this is by careful plotting of the protagonist’s arc. How so? Well, what the protagonist learns by the end of the piece tells you what your story is really about. • For example in The Descendants we’re drawn into the story to see if Matt (George Clooney) will track down and confront his dying wife’s lover Brian (Matthew Lillard) but we’re more connected to whether or not he will be able to reconcile her betrayal. His final speech to her shows us he’s been able to do this and tells us the story is about forgiveness. • In The Artist we’re invested in the film to see if George (Jean Dujardin) will be able to revive his career but what we really want is for him to put aside his ego and embrace change. His decision to shoot a “talkie” with Peppy (Berenice Bejo) tells us he’s been able to do this and establishes the theme as the danger of hubris. • For Win Win the conflict centers around Mike’s (Paul Giamatti) decision to have himself illegally appointed as his aging client’s (Burt Young) guardian moving him to a senior’s facility against his wishes. This creates a string of problems that invest us in our desire to see Mike come clean and right the situation. The fact that he does tells us the story is about the importance of honesty. • During Midnight in Paris we’re drawn through the story to see Gil’s (Owen Wilson) magical travels in time but what we really want is for him to come to terms with his life in the present. When he turns down Adriana’s (Marion Cotillard) request to stay permanently in the 1890’s we know that he’s done this and that the theme of the story is that despite the allure of the past it’s better to accept the present. • While watching The King’s Speech we want Albert (Colin Firth) to be able to speak in public without embarrassment but what we really want is for him to become more confident, come out from behind his father’s shadow and embrace his role as King. The fact that he eventually does this tells us the theme is learning to accept and believe in yourself. • In Up were invested in the movie to see if Carl (Ed Asner) will make it to Paradise Falls but what we really want is for him to reconcile the death of his wife and befriend Russell (Jordan Nagai). When he finds Ellie’s note in his scrapbook and goes on to rescue Russell from Muntz (Christopher Plummer) we know that while the piece has been a fun adventure it’s really about overcoming loss, reaching out, and embracing life. These examples show how you can use the protagonist’s arc, specifically their epiphany, to articulate what the story is really about. So in thinking about theme you can look to where you want your protagonist to go and how you want them to change over the course of the story. This will point you in the direction of your theme and make sure your story has a reason to be told. Four years ago director Anne Renton, looking to direct her first feature, found The Perfect Family by Claire V. Riley on Inktip. Off a referral from FIND (Film Independent) we started working on the script. Anne and her producing partner, Connie Cummings, hired Paula Goldberg for the rewrite and, well, multiple drafts later (that’s the Cliff Notes version) Anne was shooting her movie with Kathleen Turner, yes, THAT Kathleen Turner, in the lead! 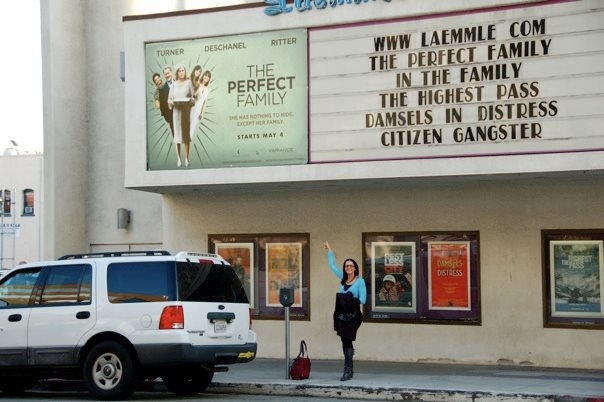 The Perfect Family was the gala closing film at LA’s Outfest last July and is in theaters right now! Congratulations Anne!!! Wow. It’s been months since I’ve posted anything. When I launched my website and started this blog I had lofty intentions of posting weekly. Ha! Then I promised myself I’d post monthly. Hmmm. Every other month maybe… Well here it is 10 months since my last post and you can see where all those good intentions got me. So where have I been? Basically too busy to blog. While being too busy to blog is kind of the problem you want to have (as opposed to needing a root canal for example) I’m back with a renewed commitment to keeping my blog up to date no matter how busy I am. Hope to see you here weekly, well ok, how about monthly for starters? And in the meantime you can always follow me on twitter @ruth_atkinson somehow 140 characters is easier to keep up than a full blog entry! Working with writers, both new and experienced, my goal is to help them make their script as strong as possible. This process involves on-going conversations about what works and what doesn’t and invariably results in suggestions designed to align the piece with the writer’s overall intentions. Sometimes this leads to suggesting changes a writer may not be inclined to make. Some well thought out resistance is expected from a writer it tells me you know your story. In fact part of your job as a writer is to take a note, filter it through your intentions and rewrite (or not) accordingly. Yes, really, I’ve had these conversations. While no writer wants to languish in the world of rewrites for too long the above excuses are just that – excuses to avoid doing the hard work of rewriting. Sometimes writers I work with get frustrated by how many drafts it takes to get a piece to work successfully. They want to give up and they find ways to validate why they should. I encourage them to hang in there and keep chiseling away at their script. Writing and rewriting is a marathon not a sprint. It takes time to develop characters, fine tune the structure and find your theme. Oftentimes it takes several drafts before you discover what your protagonist’s epiphany needs to be or what your story is really about. But there are other reasons to keep plugging away chief among them: Your career as a screenwriter. It’s true your piece will be rewritten when it’s optioned. But hopefully it’s you doing the rewriting. For example perhaps your script has a very solid, commercial idea at the core. A production company can see the marketing potential but the script itself isn’t as strong as it needs to be. So they’ll option or purchase it and immediately assign a different writer. Ok, great, you say, I need the dollars. And sure there’s always that. But there are two problems with this scenario – you may not end up with a credit and the completed movie may not resemble your vision at all. So while you’ve got a few more dollars in the bank you haven’t moved your career as a writer forward. Your only defense is a really well written script that shows your talent, voice and ability so that attaching someone else becomes unthinkable. Another reason to stay attached to your script is so you have an opportunity to gain the experience of working with producers, directors and actors to develop your project. If you are cut out of the process at the option stage you don’t get this opportunity. You won’t see how a script changes with the input of the creative team. How the actor will interpret the role or finesse the dialogue. How a director’s vision will take your script to a whole new level. You won’t get to be on set to watch it all come together or screen dailies that will give you insight into your work. Not all writers get the chance to see their project through to filming and yes, in the current landscape this is becoming even harder to attain. But why lessen your chances with a script that’s not your best effort? By not pushing yourself to go that extra mile and do the rewriting required to make your script the absolute best it can be you are only cheating yourself. No one said it was going to be easy but enough excuses! Write a great script so that you can move your career forward and get a credit you are proud of. It’s looking to be a busy summer for films I’ve consulted on! Ocean of Pearls will be in theaters in Canada on June 17th, 2011! You can see it at the Raja Cinema, in Vancouver, the Movie Dome Theatre in Calgary and the Albion Cinema in Toronto. Outfest LA’s premier gay and lesbian Film Festival, running July 7th – 17th 2011, has just announced that The Perfect Family starring Kathleen Turner will be the closing Gala film. 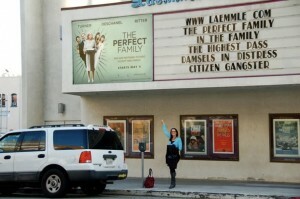 The Perfect Family just had its world premiere at Tribeca where it received rave reviews. Check it out if you’re in LA this July! You can see a clip from the film here. I’ve often wondered what makes a successful writer. I’ve tossed around many attributes like talent and connections but the one thing I keep coming back to is productivity. A successful writer is one who writes. Who actually writes. Consistently. For most trying to balance their everyday lives with a writing life can be difficult. But what’s perhaps even more difficult is learning to define and accept your own unique process for writing. Many screenwriting books will tell you to write everyday. Of course this is sage advice. But this isn’t really enough to help you define your process. In my case I’ve found that it’s very difficult for me to jump right in and start writing. I need a whopping 30 minutes to get in the right mind set. This usually means answering e-mail, checking facebook and reading a blog or two. I use to get irritated with myself for not getting down to work as soon as I sat down at the computer but I’ve realized much like a dancer doing a warm up this is my warm up. I need it to be productive. I’ve also realized that midway through a project I will invariably reach a point where I think everything I’ve written is completely half-baked. It’s like a mid-life crisis on paper. This has happened enough times now that I know that if I just keep working this feeling will eventually subside. I’ve also had very good success with chunking down the process into one or two hour blocks. This means that I set a specific time period and for the duration I don’t check e-mail, quickly look up an actor’s name on IMDB, tweet, or call my dentist to set up an appointment. It’s amazing how much more productive I am when I just stay focused. Another thing I do is work at night. Once again this is something I used to question because it seriously cuts into the amount of sleep I get. But for me I’ve come to see that sleep is overrated! I love working at night. It’s quiet, I can’t make any phone calls, there aren’t any facebook updates (well except from my friend visiting Thailand) and overall it’s much easier to stay focused on what I need to accomplish. I know a writer who has to clean the house before she sits down to work – even if it takes close to an hour. I know another writer who can only write when fueled with coffee and music. Loud music. Usually something that relates to the piece he’s working on. I have a friend who’s a poet and she’s unable to work in the quiet of her apartment so she spends long hours at Starbucks nursing a single coffee and getting a ton of writing done. I encourage you to think about your process – don’t judge it – just look to see if there’s a pattern. Perhaps the very thing that you think stands in your way might actually be part of what you need to do in order to be productive. We’re all unique in our process if you can define and accept yours you’ll undoubtedly be more productive. And of course keep writing. Every day. It’s still the surest way to finish your script! This past year I’ve gotten to know several lunatics, gone on a handful of road trips, experienced the struggles of an inter-racial couples in both the deep south and East LA, endured winter in the Sierra Nevada foothills in the late 1800’s, grieved along with a young boy who lost his mother in rural South Africa, took part in the 1989 uprising in Tiananmen Square, longed for Santa to bring a coveted Christmas toy, went on a couple of reality shows, visited Japan with a jaded school girl and took a vow of silence in Uzbekistan. All of these amazing worlds, and more, I found in the pages of the scripts I’ve worked on. As a story editor I get to travel the world without having to stand in line at the Jet Blue ticket counter or debate whether or not I should let security “touch my junk.” So to all the writers I’ve worked with this year thank you for letting me inhabit your worlds without having to cram myself into an economy seat or deal with a surly flight attendant who’s stingy with the liquor. The Black List is a list of Hollywood’s most liked unproduced scripts. Originally started in 2004 with contributions from 75 studio and production company executives it has grown to include the opinions of over 300 executives. Past nominees since produced include Lars and the Real Girl by Nancy Oliver and Oscar winning Juno by Diablo Cody. Predicament, a New Zealand produced black comedy / thriller, written and directed by Jason Stutter screened in Los Angeles on November 5th as part of DGA’s Directors Finders Series in partnership with The Screen Directors Guild of New Zealand. The screening went very well and landed Jason an agent at Paradigm. Congatulations Jason! Directors Finders was established in 1998 by the the DGA Independent Directors Committee . The purpose of the series is to spotlight undistributed independent feature films and their directors. Since its inception the series has screened 100-plus films and more than half of those screened have been picked up for North American distribution. No not a list… just a great new movie directed by Quentin Lee and written by Koji Steven Sakai, which I helped shape as a script consultant, playing in Los Angeles at the Sunset 5 August 27-September 2nd 2010. Great review in the Huffington Post you can check out here or the LA Times review here. And the review in The Examiner here.